Official Manikin of the Firefighter Combat Challenge. Firefighter shown in picture not included. Rescue Randy "Large Body" (6' 1") was developed for lifelike adult or juvenile victim handling, transportation, and extrication training. 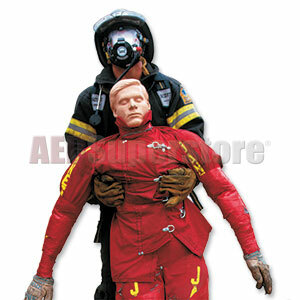 These manikins can be safely used in situations too hazardous or uncomfortable for human volunteers. Made of durable vinyl with 4,100 lb. test plastic-coated cables. Used by the U.S. Military, Fire, and Police Departments, Safety Teams, and Emergency Personnel for rescue and extrication from pole top, confined spaces, collapsed buildings, smoke rooms, and ladder carry-down protocols worldwide. Manikin comes with a pair of short pants. Turnout gear not included. Please Note: SOME OF THESE ITEMS ARE TOO LARGE FOR SMALL PACKAGE CARRIERS AND WILL SHIP VIA FREIGHT TRUCK. On time and as advertised, couldn't be more pleased.